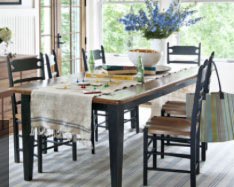 Vermont Farmhouse Dining Room, Featured in Country Living Magazine. This serene and simple farmhouse dining room was featured on CountryLiving.com. The table featured is a 7ft. Farm Table with Tapered Legs, and the chairs are French Country Paysanne Chairs with wood seat. Kate Madison offers this solid-wood table and chairs, so you can easily recreate the relaxed French Country look of this dining room. Time to Get The Look for your upcoming summer gatherings! French Country Table in Espresso (Shown in Espresso). Paysanne Chair, (Shown with Natural with a Seagrass Seat). Available in many colors.